It was here on October 31, 1517 that Luther sparked the Reformation when he nailed his 95 Theses to the Castle Church door. LUTHERSTADT WITTENBERG is known as the birthplace of the Reformation. It was here on October 31, 1517 that Luther sparked the Reformation when he nailed his 95 Theses to the Castle Church door. Today, a massive bronze memorial door marks the spot that changed the course of history. Pay your respects to the Great Reformer at this door or at his grave inside the church, beneath the pulpit. Another significant church in Wittenberg is the City Church, regarded as the “Mother Church of the Reformation”. Martin Luther preached, was married and baptized his six children here. Be sure to attend one of the English services that takes place weekly from Wednesday to Saturday between May and October in either of the two main churches. The Luther House, a former Augustinian monastery and Luther’s home for more than 35 years, is now the world’s largest Reformation museum. Luther’s living room is a real highlight with his original desk and 500-year-old period furnishings on display. The remarkable Ten Commandments painting by Lucas Cranach the Elder, a Luther Bible from 1534 and a letter of indulgence can also be found here. At the Melanchthon House learn about Martin Luther’s formidable “right-hand man” in the permanent exhibition Philipp Melanchthon: Life – Work – Impact. Martin Luther’s birthplace, LUTHERSTADT EISLEBEN, claims to have introduced the world’s very first “heritage tourism” site with the biographical exhibition Where I Come From – Martin Luther and Eisleben. The font where Luther was baptized in the City Church of St. Peter and St. Paul still remains, and the new Luther Font was built as a tribute to the Great Reformer. Also, the Church of St. Anne was consecrated by Martin Luther and was the first Protestant church to be built in the region. The pulpit from which he preached is still used today for major religious occasions. Luther’s Parents’ Home in nearby MANSFELD-LUTHERSTADT sheds light on the history of Luther’s childhood and the Luther family. Luther’s Death House, a late-Gothic reconstruction of the house in which he died, also can be visited. The new exhibition includes furniture, documents and signatures, as well as the original cloth that covered Luther’s coffin. EISENACH invites you to wander through picturesque streets to the historic market square, which is lined with half-timbered houses. The city is the birthplace of Johann Sebastian Bach, a passionate Lutheran, who was baptized in St. George Church, where Luther sang in the church choir as a boy and later preached. In the Bach House short concerts featuring historic musical instruments take place every hour on the hour. The historic part of the museum is dedicated to Bach’s life and family, while the modern part focuses on his work and music with multimedia experiences. 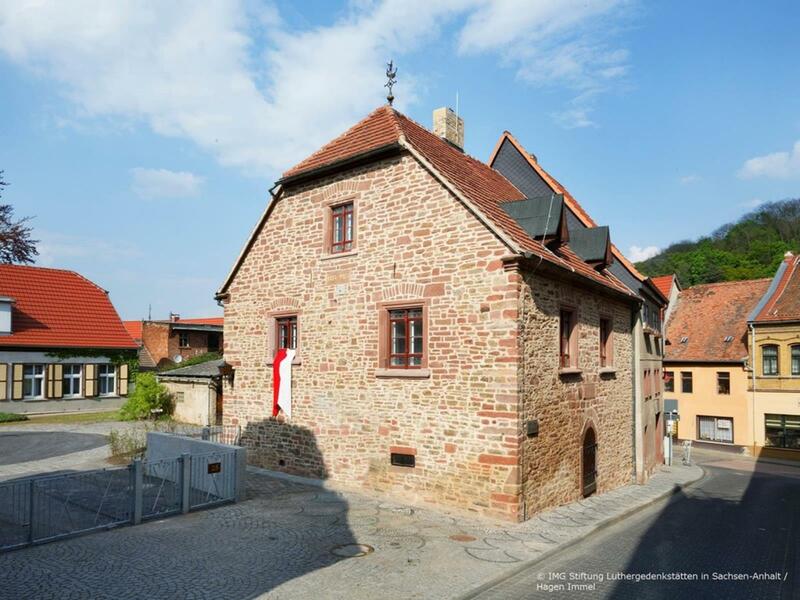 In fall 2015, the renovated and extended half-timbered Luther House from the 14th century will re-open as a museum, with the new permanent exhibition Luther and the Bible as its focal point. Visitors can also see the two rooms where Martin Luther lived with the Cotta family as a child or simply relax over coffee at the Bible Cafe. Nestled among the hilltops of Eisenach is Wartburg Castle, where Luther translated the New Testament from ancient Greek into German. Making the Word accessible to the common man was his greatest cultural achievement. At the impressive castle, a UNESCO World Heritage Site, step into the Luther Cell, where Martin Luther stayed and, whilst hiding, completed this great work in only 10 weeks. 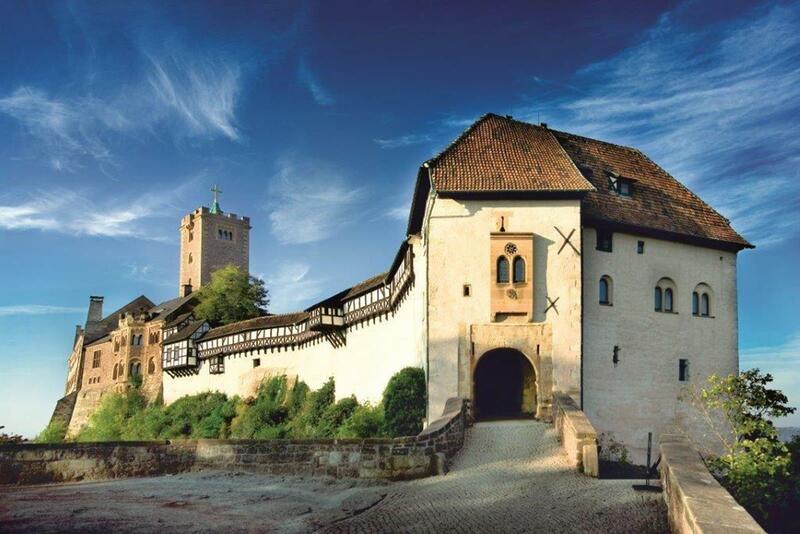 The very spot that God’s voice “thundereth marvelously” and where Luther faced his own mortality and devoted his life to God after being caught in a thunderstorm is in STOTTERNHEIM, near Erfurt. Visit the Luther Stone, a memorial to the momentous event that profoundly changed Luther’s life forever. Erfurt, undeniably one of Germany’s most beautiful cities, was Luther’s spiritual home. It is where he studied, became a monk and was later ordained as a priest. Luther served as a monk at the Augustinian Monastery, now a pilgrimage center. In the monastery church you will find the stained-glass windows with the famous Luther Rose, the earliest symbol of Lutheran beliefs. The monastery offers 67 guest rooms and apartments for long- and short-term stays in a serene atmosphere. It is also a modern conference center and museum, with a breathtaking historic library. Peek into the chapter house and enjoy the wonderful acoustics that Luther appreciated, or stop by the Luther Cell during your stay. Follow the “Luther Mile” through Erfurt and visit St. Mary’s Cathedral, where Luther was ordained. Next door is the St. Severi Church. Standing together on top of a hill, the photogenic cathedrals, connected by steps, serve as a stage for the annual Open-Air Cathedral Steps Festival and Christmas Market. Erfurt, nicknamed the Rome of the North, will not fail to impress. Merchants’ Bridge, arching across the Gera River, is Europe’s finest example of a medieval inhabited bridge and dates back to 1325. There is no better way to experience authenticity than going off the beaten path. 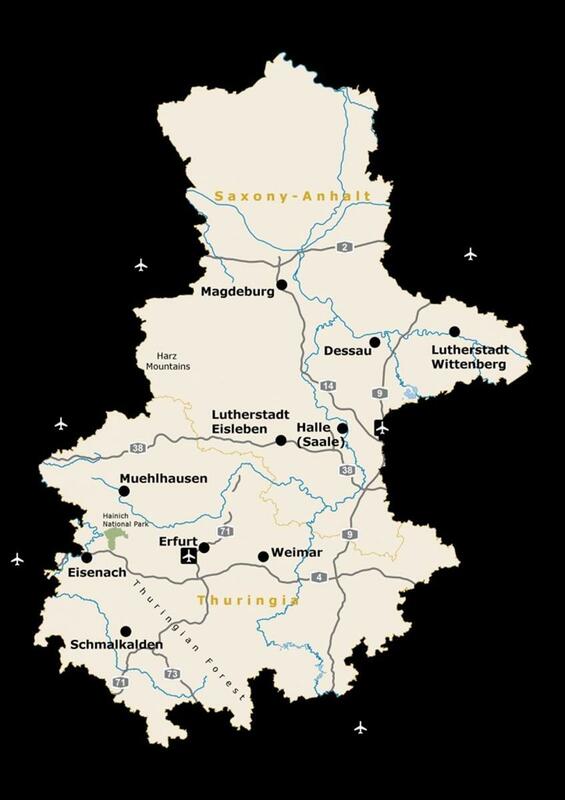 Follow the LUTHERWEG (Luther Trail), a route that connects many Luther-related locations. Visit Schmalkalden, the half-timbered town with the Luther House and where Luther gave sermons at St. George’s Church and published the Schmalkaldic Articles of faith. LutherCountry is also home to romantic medieval cities like QUEDLINBURG. In MAGDEBURG, prominent during the Reformation, great Gothic architecture can be seen in Magdeburg Cathedral, the first in Germany to be built in the Gothic style. Martin Luther, together with Bach, Goethe, Liszt, Gropius and Lucas Cranach the Elder and Younger, was a man who appreciated the fine arts. Discover the city of Weimar, where all of these great men left their mark. Luther had a tremendous influence on one artist in particular, Lucas Cranach the Elder. Cranach was a strong supporter of Luther, and several of his most important works are on display in the Anhalt Picture Gallery in Dessau. Cranach changed the way religious paintings were composed, conveying Lutheran ideas through his art. in halle (saale) step inside the market church and see the original cast of Luther’s death mask. The Francke Foundations is the orphanage where Henry Melchior Muhlenberg, known as the Father of the American Lutheran Church, taught before traveling to Pennsylvania.